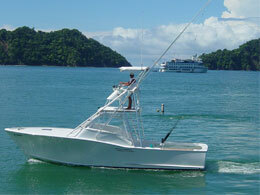 Only the finest Costa Rica Sport Fishing and charter services are approved. We are an independent company that continuously monitors the quality of service provided by many of the top Costa Rica sport fishing companies. We work directly with the owners or managers of the boats, not booking companies. From the basic economical half day inshore fishing trip all the way up to 8 full days including lodging, we evaluate the customers overall experience and the actual quality of the package provided. Costa Rica fishing review criteria is based upon prices, equipment, professionalism, booking process, customer support, and a service providers ability to go the extra step to insure your satisfaction. This boat was built in Costa Rica to match the ocean fishing conditions perfectly. For some years now is has been considered one of the best sport fishing boats in Los Suenos Marina in the 29' to 32' class. The 38' length of this boat provides a smooth ride even in the wind. Designed with the fisherman in mind, she's equipped with a fighting chair, live well, and full electronics. Fly fishing gear is also on board for those that want a real challenge. This sweetheart is a luxury twin diesel engine sportfisher that can seat six comfortably, but is also ideal for two or more. She's outfitted for serious fishing with state-of-the-art equipment, as well as the features demanded by those with an eye for the best. 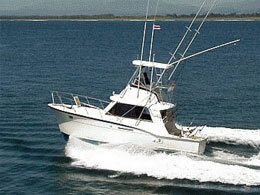 Tamarindo has lower prices on sport fishing boats. As most of you know Hatteras makes a fine fishing machine with some of the comforts for the family or those that want to relax. This jewel is one of Quepos Costa Rica's finest boats and the crew has the record to prove it. Costa Rica Fishing will give you more than you pay for. We put this site together to bring you something different . There are so many different types of fishing charters that it's hard to know where to start from. Our break down in categories will make it easy to find a package that matches your budget and put you into some good fishing. No need to search twenty web site's and send a bunch of emails that no one responds to. We have compiled our data and now are working daily to get it posted so that you can make an informed choice for your fishing vacation. Check out our most recent additions by following the link on the navigation bar on the top that says "Costa Rica Fishing Packages". For the real fishermen in all of us. Your day begins at the famous Los Suenos Marina located just outside of Jaco Beach, Costa Rica. 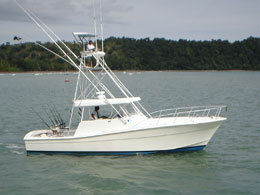 A 31 foot Palm Beach that is well equipped for both inshore and deep sea fishing in Costa Rica. 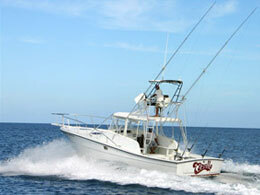 Eduardo offers charter fishing trips from 1/2 day up to one week in all price ranges. Take a look! All the sites will feature a break down of prices and descriptions of the available fishing packages they have. This will allow you to just pick and choose or compare what each company has to offer. You might not known it, but there is a lot of differences in each company and you will be sure to find the one that is meant for your vacation. Most of the anglers that visit Costa Rica come from the United States. Is this a nice Roosterfish or what? Here was one happy client, he was on a month long fishing trip here from Alaska. Costa Rica Billfishing is by far the most popular. Marlin and Sailfish are on the top of the favorite list. To find these angler dreams typically will require a full day fishing trip into deep water. They are usually over 10 miles off the coast depending on where there is a sharp increase in water depth and a change in water temperature. Trolling for these trophies is most common but many also like to give lighter tackle such as spinning equipment and fly fishing tackle. Curious what kind of fish you can catch while sportfishing in Costa Rica? Check out our Costa Rica Fish Identification chart. Why is it that Costa Rica Sportfishing is so popular? That is an easy answer if you don't already know. We offer one of the largest assortments of fish to choose from in the world. From small mountain lakes, streams, and rivers, all the way down to the Pacific and Caribbean Coast. Don't take us wrong, the United States, Canada, and South America all have great fishing also, but they don't have the perfect weather and low wind conditions that Costa Rica offers its fishermen. If it's Tarpon you're after you might want to take a look at the Caribbean side of the country at a place called Barra del Colorado. It is the home to some excellent areas for these very large silver fish. Costa Rica Tarpon fishing is second to nothing on the planet according to some sport fishing fans. Are you looking for a Costa Rica Fishing package that is all inclusive, or just a one day trip? How about 1/2 day trip for $200? Maybe you have something more in mind for the family and need a week on the water. Now we are talking a really good time. You are going to spend time deep sea fishing and inshore fishing. You will be able to run heavy equipment one day and a fly rod the next. There's a challenge for sure that awaits everyone on these types of trips. Find a Costa Rica Fishing Vacation today and get ready for the time of your life in a land filled with adventure and great weather. Try out the interesting Tico style foods and their great fruit beverages. This place will forever remain in your heart and bring a smile to your face with its remembrance. Jaco - Playa Hermosa - Quepos - Puerto Cortez - Drake Bay - Carate - Puerto Jimenez - Gofito - Zancuda and more. We are now adding new companies to our site. Soon you will be able to find Canada, Alaska, and Florida Fishing service providers here. Recently we added a few more boats that you may have an interest in. Fishermen really enjoy Sportfishing in Tamarindo so to meet their demands we now have some fine packages to choose from in that area. Check out the only panoramic beach shots of northern Guanacaste beaches and bays all at one location. See where your fishing trip will begin. 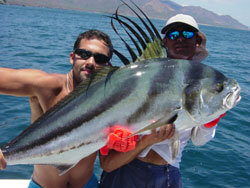 Check out our new Costa Rica Sport Fishing Vacation Itinerary area. This will give you an idea of the type of tailored fishing packages we can put together for you. More coming soon.